** ADOPTED! ** Weasel is a six month old bull terrier who is new to our program. He gets along with other large size dogs, but no small furries. Weasel will benefit from some professional training and a family who are prepared to steer him in the right direction! 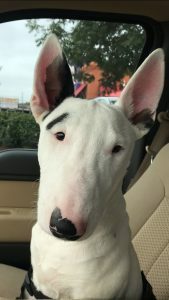 Please complete our application at – www.texasbullterrier.org – if you are interested in making Weasel part of your family.